"Einen Geldscheißer sollte man haben." ("A money crapper would be a fine thing."). This coarse but apt Swabian saying gave the artist Rolf Weinhardt the idea for a sculpture he was asked to produce by what was then the Waldenbuch Bank. Since 1992 the copper statue of the Money Crapper has therefore stood in front of the bank, an indisputably provocative figure, his trousers around his knees. The bank had been looking for a work of art with a bit of verve, which is why they opted for Rolf Weinhardt's concept. "At first some people were disconcerted, but in the meantime they've come to accept it," declared Bernhard Wagner, PR manager of the Volksbank Schönbuch, to which the branch now belongs. "How could they!" was some people's reaction, the artist reports. "But others laughed out loud; they loved it," Weinhardt recalls. Commissioning Weinhardt of all people to produce the sculpture was a natural choice, because in 1992 his workshop was less than 50 metres away from the bank. The artist's ancestors had owned a smithy there since 1759. Rolf Weinhardt, too, followed in his father's footsteps, became a master metal worker and took over the firm. He had already shown a creative streak at an early age. "When I was 14 or 15 I forged my first candlesticks and similar items," Weinhardt explains. He staged the first exhibition of his art when he was only 17 years of age. There are more of Rolf Weinhardt's sculptures in the vicinity, for example the "Beerlesklopfer" ("Berry Beater") in Steinenbronn, and in Waldenbuch the "Stagecoach" and also the "Tree" that commemorated the town's 700th jubilee. However, he now has little time for his creative activities. His firm has relocated to Dettenhausen and no longer forges metal, instead designing and producing special containers for highly-sensitive automobile components. The "Money Crapper" is absolutely unique. Unlike many bronze figures, the sculpture was not cast, but beaten by hand from a sheet of copper. This was a particular challenge for Weinhardt. He didn't want to produce a work of art from which several casts could be made, but to find his own specific style and create something that would be a one-off. Art, for him, evolves out of craftsmanship. This is why Rolf Weinhardt wanted to produce the figure using manual skills, in this case with a hammer and anvil. There was no sketch or template, nor did anyone pose for him. It was all done by intuition. 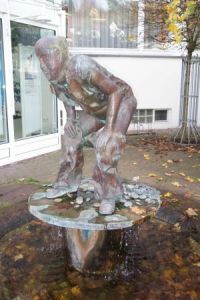 The inflow of water to the fountain is intended to symbolise that the bank is essential to cash flow, so that the "ducats" thus produced can be invested and brought into circulation. Ten metres away from the sculpture, by the way, is a modern "money crapper" – a cash dispenser!